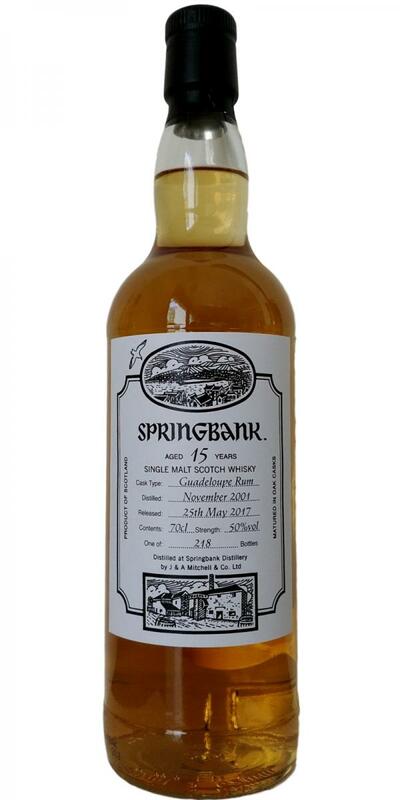 [May, 2017] I had this dram during a Springbank Masterclass tasting at the Campbeltown festival. The colour is pale straw and the texture shows fast legs with tears. The nose is on strong rum and some peaty aromas with a nice OBF (aceton). And some old newspapers with a lot of printing ink. The mouthfeel is very smooth and warming. The taste is (like the nose) quite old-stylish (what I adore) with a good balance of vanilla-sweet and rum flavours. The finish is long and mainly rum-driven (as so often with rum cask maturation, obviously the rum flavours tend to stick longer to the throat). Water is not needed as it flattens the dram.A very nice selection for the Springbank open day at the Campbeltown festival, but given the vast number of visitors a limited edition of just 218 bottles is simply a bad joke. At least every (physical) visitor to a festival should have the chance to buy one festival bottle - otherwise a lot of people are dissatisfied and do you (Springbank owner & management) really want this to happen? PS: Why not consider this proposal: Every visitor can buy just one bottle (so he/she has to decide which edition out of the three). If bottles are still left by 2pm everyone can go for a second... (to control no one cheats simply write a sign on the right hand with a permanent marker after one got his/her bottle - it worked fine at Kilchoman distillery during the Feis Ile).